Cage Kit with Matte Box, Shoulder Mount and Follow Focus designed specifically for the BlackMagic Pocket Cinema 4K Camera. Cage Kit with Matte Box, Shoulder Mount and Follow Focus designed specifically for the BlackMagic Pocket Cinema 4K Camera. Camera not included. 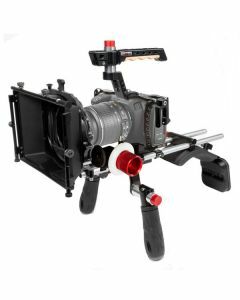 Also includes matte box 4x4, follow focus, top handle, quick handles, 15mm quick release rod base system and 15mm rods.